Today I published a short piece in the Guardian about my sightings of wasps and spiders duelling and preying off one another. However I had more extraordinary encounters this weekend while meadow making at Blackwater. I thought it worth some extra words. But the first thing to say is that both carry toxins that would be lethal for the other: a wasp sting on a spider would surely be fatal, just as a spider bite can clearly kill a wasp. Even so, I was surprised to find a wasp stealing prey out of an active spider’s web (belonging to a garden cross spider). While continuing to fly (albeit in rather static hovering mode) the insect pulled the desiccated spider prey out the centre of the web, tugging the mashed protein until the spider’s silk attaching it to the web snapped. It would be interesting to know if this wasp worker had developed this kleptoparasitic practice serially, stealing from one web after another? Either way it was apparent that the spider was taking no chances and dropped clean out of its own web onto vegetation below. But the wasp’s behaviour is also high risk, as I learnt later. The next sighting (the one I described in the paper) is here below. The wasp was already enmeshed, its aristocratic jawline and those sad black oval eyes looking extremely melancholy from behind their veil of spider silk. My article was largely about the tiny little male spider that tried to take advantage of the female’s recent catch to sneak in to mate. Here he is making his move, but she was having none of it and would have eaten him i suspect if he had not been nimble. The sighting that was most riveting is partly illustrated in the picture at the very top. It shows a beautiful female marble orb weaver that had just caught the wasp as I chanced upon it at Blackwater. Go back to the picture (it should enlarge if you click on it) and you can see her first moves to tackle the wasp. She approached it all from below, well away from that lethal abdominal sting. One wonders if she’d ever encountered a wasp before and how she ‘knew’ how to manipulate it. But her first goal was to immobilise the wings and head/thorax. 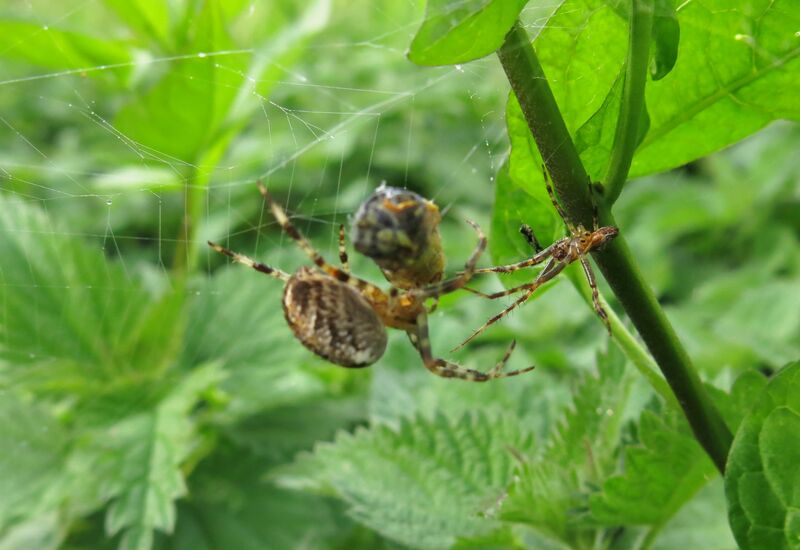 Then, when these were tightly bound, she worked carefully around the wasp’s abdomen and firing silk from her rear spinnerets she soon had it much as you see the garden cross had got hers – entirely bound like brisket in tight silk. Even so, the wasp at this stage was very much live. I could see its abdomen still pumping vigorously. The next part was the most remarkable. The spider moved in and i could see the exposed needle-like jaws opening wide as it injected venom into the insect. Often spiders drag large prey up to a shelter which is invariably to one side of the orb web. A leaf or a grass stem forms the A frame to a kind if silked-over tent, where the arachnid can feed unobserved. But this spider, rather than using its legs directly to move the wasp into place, pulled it up on a long strand of silk, thereby keeping the wasp at all times a safe distance from itself. Even when it had got into position in the shelter it left the wasp dangling like a load on a rope pulley a few centimetres below itself, presumably giving the injected poison time to work. Then it finally hauled the wasp in tight and started to feed. The interesting and mystifying part for me is how the spider ‘knew’ how to work this particularly risky type of food. It may have met wasps before but spiders are quite short lived. My guess is it is not relying on previous experience to guide it. How has it acquired the ‘knowledge’ to avoid the dangerous rear end of a wasp? The aposematic warning colours – yellow and black – of the wasp are surely a helpful cue to the spider that it is dealing with something unsafe, but how did it ‘know’ that keeping the trussed-up insect on a long leash as it climbed to its shelter spot was advisable. My guess is it is all instinctual. Nothing is processed in our sense of ‘thinking’ or ‘reasoning’. The creature has inherited behaviours from generations of successful spiders, going back millions of years, and this ancient, genetically programmed suite of reactions builds into an ‘operation template’ that allows it to catch and overcome something as potentially poisonous as itself. ‘It’s a strange world Sandy!’ as Kyle MacLachan said to Laura Dern in the film Blue Velvet. One of the fascinating things about managing any patch of ground is learning to envision it ecologically: conjuring it not as it looks at any one time but as it will be at all stages. Meadow-making is thus an act of imagination and of faith. My particular hope is that the scene you can see below (the first image was taken on 30 November, the second in May this year) will slowly evolve into a lower, shorter (and more manageable) sward richer in meadow plants. See also Meadow Making for the backstory to all this. My ally in the business was yellow rattle, whose papery seeds I bought in 100-gm packet. I spread most of them on about a third of an acre after rigorously mowing it with our small petrol lawnmower in autumn. The recommended date is August-September but mine was delayed and some was not cast until December. 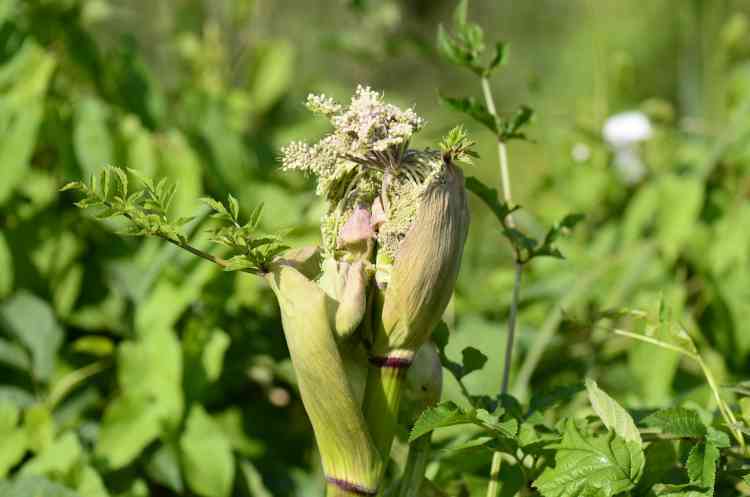 It seemed to make little difference and even the late-sown seed produced a fabulous abundance of flowering plants come the late spring, possibly with the second cast flowering slightly later. Here it is in its pomp in June, but I cannot tell you how exciting it was to spot the first tell-tale yellow rattle leaves coming up in late March. 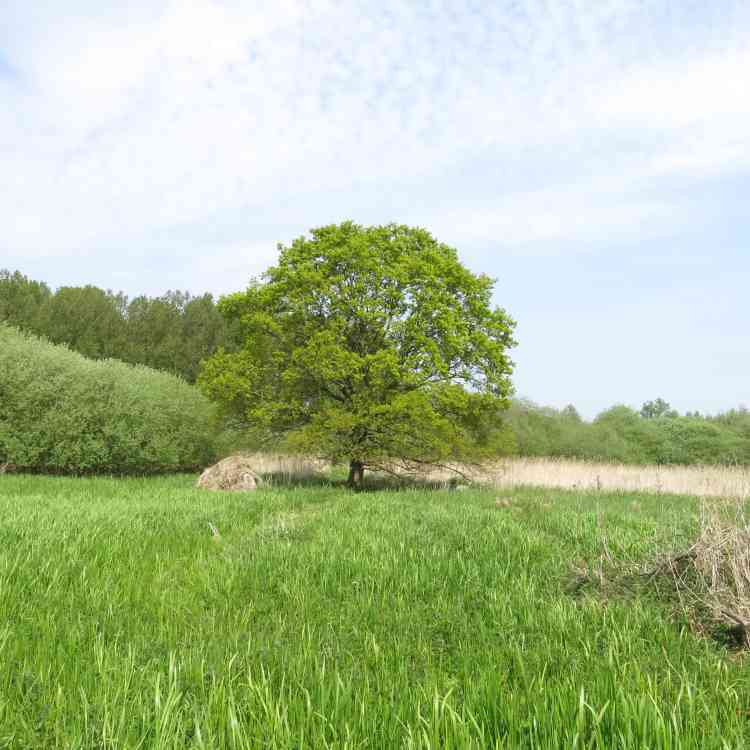 The image above is the first indicator that my meadow making plan is bearing flower and fruit. When i bought the site in 2012 there was no ragged robin at Blackwater at all. Now it is springing up everywhere (the pink flower above), along with marsh thistles (there was none when I got the site), lady’s-smock and this summer, for the first time ever, common fleabane. All these new plants are fulfilling the original ambition, which was to create a site with abundant flowers from March/April until about now (late September). In my first spring I had an early flourish, especially of sallow blossom and white dead nettle, and then there was a long hiatus until the meadowsweet and purple loosestrife started in July. Already I can see how the spring ‘colour hole’ is being filled with all sorts of nectar-bearing plants. It means that bumblebees and other wonderful insects are now present spring and summer-long with a superb abundance in August and my first recorded nests – both tree bumblebees, one in my haystack (see below) and one in a hollow tree stump. Each year has been totally different, not just with new things suddenly appearing but with commonplace residents showing themselves in unexpected abundance. Last year was wonderful for hoverflies but for some reason this summer they seem to have been much more scarce. 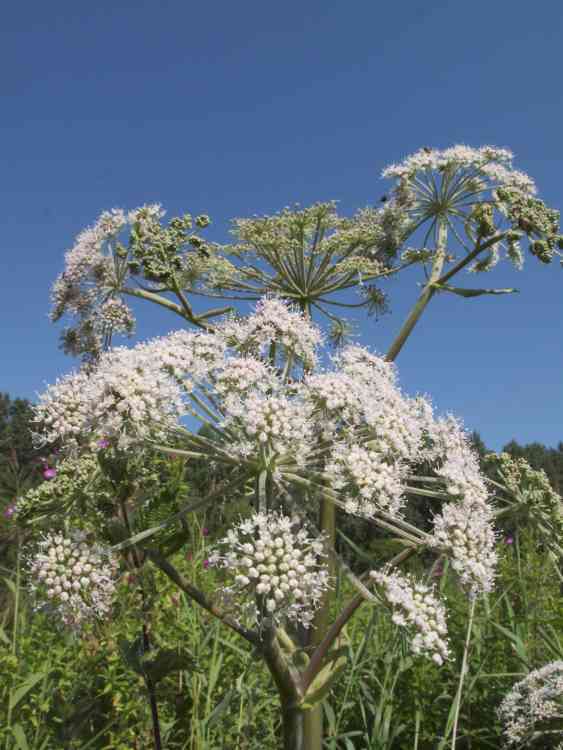 However I have had a glorious flourish of angelica, the queen of all umbellifers as far as insects are concerned. But it is also such a sculptural beast and the way it breaks out of that huge bulbous egg of green to throw out those wide white-pink arms to the sun – it behaves like an animal. I love it. 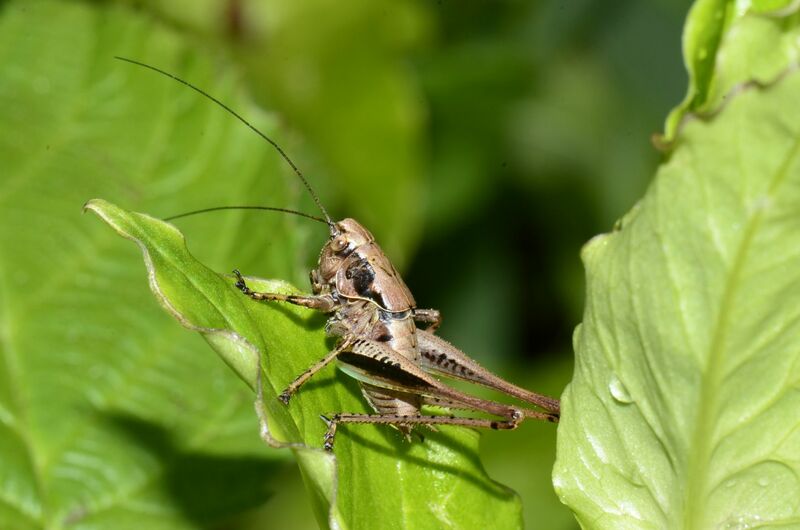 Some wonderful additions to the site, appearing for the first time this summer and singing to me yesterday as I scythed one of the last patches of tall herb, were long-winged coneheads (male, below left). I’ve long had dark bush crickets (right) and they are wonderful too but the conehead records have been special. Their sound is a really soft fragile susurration like an old foot-driven sewing machine but in a far room. I was crouching low to hear this tiny hiss better and realised that the beast was stridulating just near my foot. Remarkable to reflect that this species had not been recorded in Norfolk at all until 2000 and it was only recorded for the first time in Britain in 1931. Nice climate change indicator! Meadow making may sound like a walk through the flowers but it isn’t all contemplation of wonder and beauty. There’s hard graft too. This year my wonderful brother Andy came down to help. I have previously had support from the Hawk & Owl Trust but they are only available in the early winter and really I want to intervene in the tall-herb succession by cutting at an earlier date. So we started work in August. In truth it was so hot that we were only able to work some of the time. But we were blessed with a secret weapon in one of Simon Fairlie’s Austrian scythes, which i borrowed from a friend. I have an old English brute of a scythe (vintage 1948) with a heavy beech handlle given to me by my lovely 90-yr-old farmer neighbour John. The Austrian snath is light pine and the blade itself finer, sharper and lighter. The whole scythe is twice as efficient and half the effort. 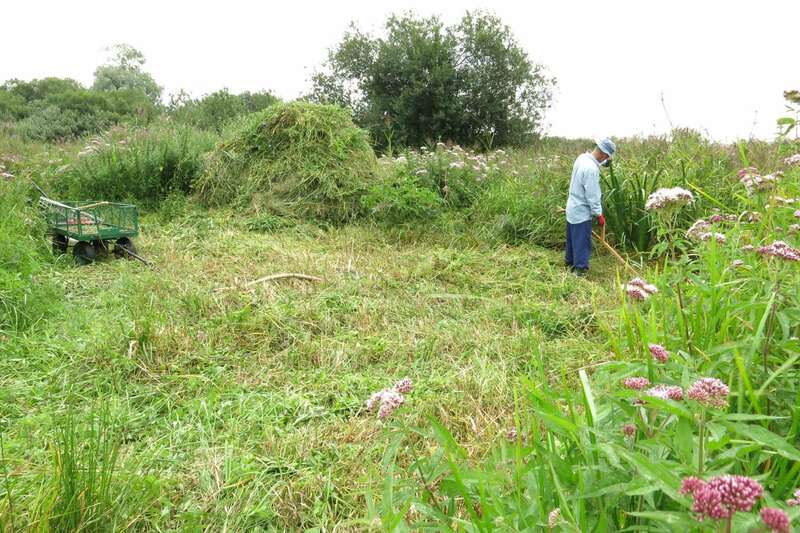 Here’s Andy midway through cutting the main yellow rattle patch. 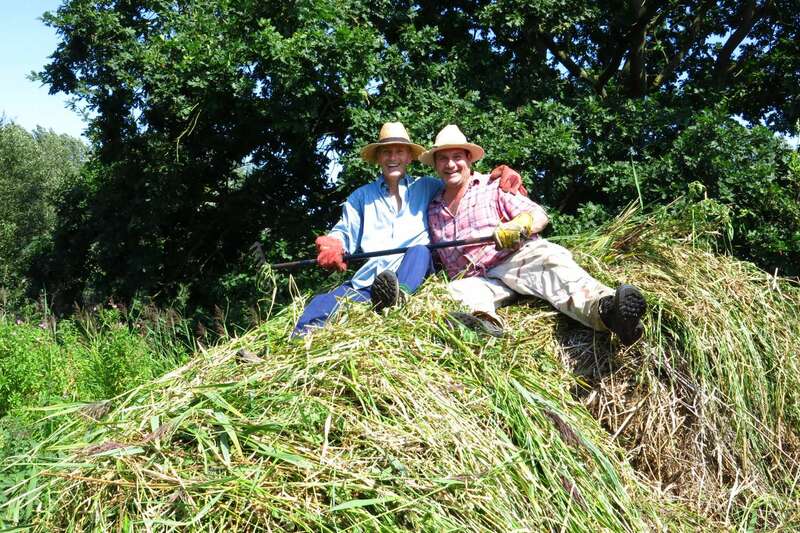 We assembled all our cutting on two haystacks. Eventually we needed a ladder to climb to the top of either, because they were twelve feet high. You have no idea what effort it took to capture the selfie below. The camera was perched on top of a ladder and i had to run in the intervening ten seconds, grab my brother’s rake, which he used to pull me up to the top of the stack. Our combined age is 114 going on 23! 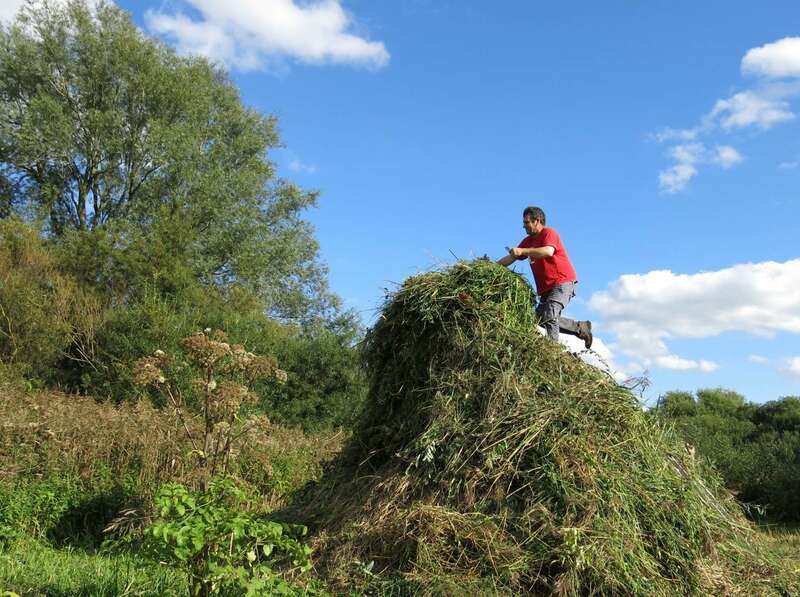 And here I am yesterday on top of what is known in our house as ‘Slub Mountain’ after I had finally cleared three-quarters of the meadow. Just one last cut to go. Any takers? ps I now have my own wonderful Simon Fairlie scythe!